Birthdays are special occasion in everyone's life. And birthdays without Cakes is simply unimaginable. 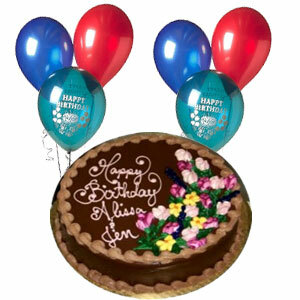 Delight your dear ones in all cities in India by sending some colorful birthday balloons (6 Piece) along with a 1 kg. Chocolate Cake. Give your dear ones a treat that they will savor for many a days to come. However, you can also send other Gifts across India through GiftsAcrossIndia.com. Please Note : The colors and size of the balloons may vary depending upon their availability.